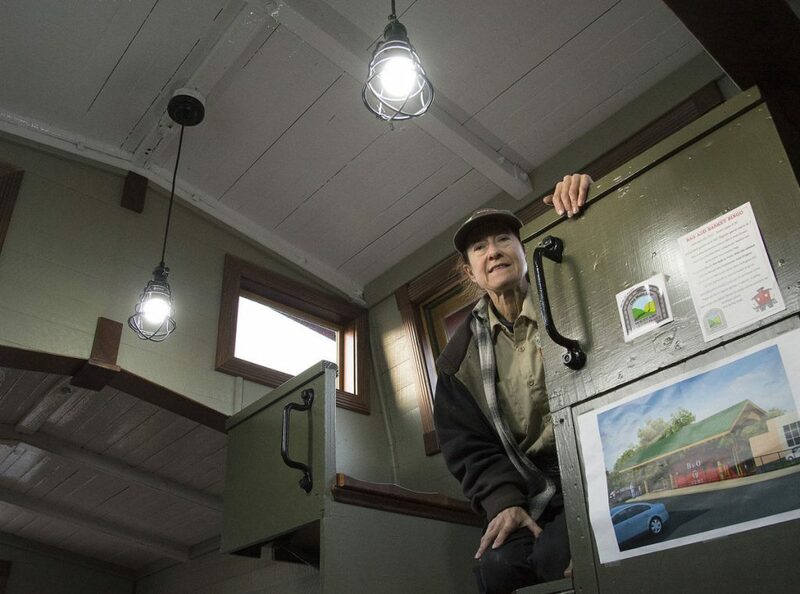 Electrician Catherine Nazarene, known as Little Sparkie, inside of the Mount Airy's historic caboose that is parked on the Main Street. Nazarene installed the electrical wiring and lighting for the caboose. Five minutes before she found out what she wanted to do with the rest of her life, Catherine Nazarene had no interest in being an electrician. She walked out back to where an electrician was doing work on her property, and peered in to see what he was doing. He was holding a meter and the numbers fluctuated between 61 and 64 hertz. Nazarene, of Mount Airy, didn’t know what that meant at the time, but she remembers those numbers. She found her passion and quickly decided to change careers. Less than a year before the Great Recession hit in December 2007, Nazarene left her job as an accountant and opened her own electric company, Little Sparkie. Nazarene survived the rocky waters of the recession, and celebrated 10 years of business this month. Nazarene credits her analytical and mechanical mind to her quick progress in learning the trade. She’s been working on cars since she was 4. She is completely self-taught with the exception of a distance-learning course she took. The course was scheduled to last 18 months. She finished it in eight. The lone problem was that the course was mostly theory work. So, Nazarene “felt stupid for a year,” as she described it, as she learned to apply the theory to the real world. Despite her inexperience at the time and the recession, Nazarene never had any shortage of customers. Her willingness to work on many things most electricians don’t, such as generators, set her apart from the competition. One of Nazarene’s newest projects came in from the town of Mount Airy. Mount Airy unveiled the caboose that lines Main Street in 2016. Nazarene was put in charge of providing the electricity to the caboose, which the town has named Mackenzie. Nazarene did the project for the town at a reduced rate, she said. She said that because the project was for a good cause, and her company is having a good year, she didn’t need to charge what she typically would for a job such as that. She added seven receptacles, two pendant lights, two wall-mount lights inside and two exterior canopy lights. The job involved some carpentry in getting the receptacles set up, and working on the steel frame of the caboose caused a couple of broken drill bits, she said. Nazarene has done other work for the town in the past as well, town council President Peter Helt said. She did electric work on poles around the town as well as helping to put up outdoor lights in the downtown area. Just as Nazarene had to navigate the waters of the recession, she now has to find ways to keep up with the changes in technology. The learning curve never ends. Even for things as simple as a light bulb. Nazarene’s company has grown to have more than 100 clients in Frederick, Carroll, Howard and Montgomery counties. Each one provides her the joy of helping someone solve a problem, she said. Frederick, MD…It seems there’s no end to the bad economic news these days, but some entrepreneurs – like Little Sparkie Electric LLC – are thriving, with hard work and an optimistic attitude. This summer, the full-service electrical contractor, which provides service throughout the greater Washington-Baltimore region, began work on a number of projects with Beretta USA Corporation at their factory facilities in Accokeek, in southern Prince George’s County. In addition, the company recently purchased two trucks. One is a new, fully-outfitted service truck, and the other is a bucket truck that was purchased from one of Little Sparkie’s customers. The company’s fleet now totals three vehicles. “We attribute our success to the fact that we see lots of opportunities in this environment. We have continued to market ourselves and to network in Frederick County and the greater Baltimore-Washington area1,” said Catherine Nazarene, a Maryland Master Electrician and owner of Little Sparkie. “Henry Ford once said, ‘whether you think you can or think you can’t, you’re right.’ He was spot-on: We can, so we will. Period. It also doesn’t hurt that we love what we do. In fact, we’re passionate about it,” Ms. Nazarene added. “In spite of all of the bad economic news, our experience is that there are many businesses of all sizes that are doing well and planning for the future,” added Ms. Nazarene. “There is work is all over the place, and not enough skilled tradesmen to meet the need. It’s a matter of seeking out the work, and then giving every project your best,” she explained. Little Sparkie is headquartered in Mt. Airy and offers commercial, industrial, and residential services. With the purchase of the new trucks, they can also offer bucket truck service for work up to about 30 feet off the ground, including repairing and installing parking lot and exterior building lighting. In a recent national survey, 75 percent of industrial small businesses say they expect their businesses to grow in the coming year, with one out of three respondents expecting significant growth. Conducted by Thomas Regional Directory Co. and MasterCard International, the survey generated responses from 5,000 industrial small businesses, defined as distributors, manufacturers, service companies and their suppliers “Industrial small businesses exemplify the entrepreneurial spirit, a ‘do or die’ philosophy that helps in overcoming obstacles that inevitably emerge during uncertain economic times,” according to a statement on the results. Another report released earlier this month by Automatic Data Processing, ADP, showed that small businesses (defined as companies with less than 50 workers) added 28,000 new jobs during September. “This month’s growth was up from August’s revised increase of 17,000, and offers a continued sign of resiliency among small-size businesses when compared to job losses experienced at larger firms,” said Joel Prakken, chairman of Macroeconomic Advisors, who compiles the ADP report. Little Sparkie’s commercial and industrial services also include remodeling and additions, new business construction, tenant build-outs, motor control installation and repairs, general trouble-shooting, plus scheduled and emergency service and repairs. On the residential side, Little Sparkie does remodeling and additions, new home construction projects, and scheduled and emergency service and repairs. The company is also a Generac Guardian servicing dealer of automatic standby and portable generators. Little Sparkie now also serves Virginia. Frederick, MD… Multiple careers and interests are not uncommon as people live longer, healthier lives. But Catherine Nazarene, a 47-year-old Mt. Airy businesswoman, has taken the concept of a full and varied life to a whole new level. A well-known and respected CPA and Accredited Tax Advisor (TM), Nazarene recently made a 180 degree switch in careers, training as an electrician and launching a new business, Little Sparkie Electric. Her head-spinning career path may not be such a surprise when you consider that through the years she’s also trained as a classical singer, tinkered with and raced muscle cars, and worked on her 1977 Harley Sportster. Singing had also been a long-time interest, and, hearing her distinctive voice, people encouraged her to do more with her talent. From 1995 to 2000, she trained at the Peabody Institute in Baltimore, one of the nation’s premier schools for professionally-trained musicians. “I trained with some of the best singers, and it was thrilling,” she notes. Some public singing appearances followed; she sang at many Mt. Airy town events, the Maryland Renaissance Festival, the Washington Arts Club, and performed the National Anthem for several years at Frederick Keys games. But then the demands of running her CPA business curtailed the pursuit of a full-time musical career. “The opera business is just too neurotic for me in so many ways,” she notes with a grin. Cars were another life-long interest. Growing up in South Carolina, she learned about engines and more helping her engineer father work on the family cars. Through the years she acquired and tinkered with her own cars, beginning with a 1972 Camaro in 1981. She currently owns a 1970 Pontiac LeMans, most of which she built herself, a 1977 Olds Cutlass, and a 1968 Chevrolet Chevelle project car. She owned a 1977 Harley Sportster motorcycle until she sold it a few years ago, and is now in the market for her first new vehicle ever, a Harley “Nightster” with the biggest engine available for the model. Her diminutive size was a real plus with racing, both on the street and at the drag strip. These days, Ms. Nazarene keeps a nonstop schedule, managing Little Sparkie Electric and working the tools in the field while her husband serves as operations manager. And she still serves some of her more complex tax and international clients – she speaks eight languages and has clients around the world. But she’s most likely to be found on site, since the company provides both commercial and residential electrical services, including selling, installing, and servicing back-up, or “standby”, generators for businesses and homes. “This area has seen some severe storms in recent years, and many individuals and businesses cannot afford to be without their computers, office phones, lighting and so forth. Additionally, homes and food-related businesses can’t risk the food spoilage if they lose refrigeration,” Ms. Nazarene explains. And because generators can be pricey – $2,500 and up for the unit alone – Little Sparkie Electric now has an agreement with Generac Power Systems to provide financing to qualified applicants for generator purchases. In late July 2007, Ms. Nazarene headed to Philadelphia for Generac’s factory training, which enabled her to obtain the generator manufacturer’s certification as a factory-trained technician. Little Sparkie’s commercial services also include remodeling and additions, new business construction, tenant build-outs, motor controls, trouble-shooting, plus scheduled and emergency service and repairs. On the residential side, Little Sparkie does remodeling and additions, new home construction projects, and scheduled and emergency service and repairs. Ms. Nazarene’s singing days aren’t over, however. She can still occasionally be found atop a ladder, happily belting out a country western tune to appreciative fellow contractors and customers. “This just really feels right. If you do what you love, the rest will follow!” she says. So, she hit the books again, started doing side jobs, and earned her Electrician Program Career Diploma with a GPA of 95 from Penn Foster Career School. She whisked through their 18-month distance learning program in eight months, and right after New Year’s 2007 launched her business, Little Sparkie Electric, with her husband, John, who is an experienced electrician. Catherine manages the business and works the tools in the field as well, and John serves as operations manager. “‘Sparkie’ is an old nickname for any electrician,” explained Ms. Nazarene regarding the name of her business. “The person who originally fired my interest in electrical work as an adult goes by that handle, and one day the two of us cooked up the name ‘Little Sparkie’ for me, because I am so much smaller than he is. Actually, I’m small by anyone’s standards, so the name was a natural. However, my energy and love of the business more than make up for my small stature,” adds the entrepreneur, who stands just a hair over 5 feet tall and weighs only 82 pounds. “And in many situations, being small is actually a big plus!” she adds. Eric Fries, a licensed electrician, has also joined Little Sparkie Electric. The company provides both commercial and residential services, including selling, installing, and servicing back-up generators for businesses and homes. For more information about Little Sparkie Electric and about their generator sales and service, call 301-606-5181 or e-mail [email protected]. Visit them on the Web at www.littlesparkie.com.